The North Dakota Minimum Wage and Work Conditions Summary Poster is a minimum wage law poster by the North Dakota Department Of Labor and Human Rights. This is a mandatory posting for all employers in North Dakota, and businesses who fail to comply may be subject to fines or sanctions. This poster must be posted in a conspicuous place where all employees will see it. This poster describes the minimum wage for both tipped and untipped employees as how overtime is dealt with as well as exemptions to the rules of overtime. This poster also discusses various requirements that must be followed for various different jobs. This poster also discusses what to do if an employee feels like their employer is discriminating against them. ND All-In-One Labor Poster: Instead of printing out dozens of posters, employers can also purchase an all-in-one poster that covers both North Dakota and Federal poster requirements by clicking here . It appears you don't have a PDF plugin for this browser. Please see the link below to download north-dakota-min-wage-poster-aug-2015.pdf.  A minimum 30	-minute meal period must be provided in shifts exceeding five hours when there are two or more employees on duty.  Employees may waive their right to a meal period upon agreement with the employer. are  not completely relieved if they are required to perform any duties during the meal period.  Other breaks (such as 15 minute “coffee” breaks) are not required by law, but must be paid breaks if they are offered by the 	emp	loyer.  Overtime pay must be paid at one and one	-half times the employee’s regular rate of pay for hours worked over forty in any work w	eek.  A work week is a seven consecutive	-day period defined by the employer.  Overtime is computed on a weekly basis, regardless of the length of the pay period.  Overtime is based only on hours worked. Paid holidays, paid time off, or sick leave need not be counted in computing overtim	e h	ours.  Compensatory time is not legal in private employment for non	-exempt employees 	— overtime hours may not be “banked” and used for 	time off in another work week.  Employees working more than one job under the control of the same employer must have all hours worked counted toward overtime	. Exemptions from overtime are listed on the reverse side of this poster. Formulas for calculating overtime are available in N	.D. Admin. Code Section 46	-03-01.
one balance, all of the hours are defined as paid time off. Sick leave is not defined as paid time off if it is kept in a se	par	ate balance. paid at the regular rate of pay earned by the employee prior to separation.  No employment contract or policy may provide for forfeiture of earned paid time off upon separation. given a reasonable opportunity to take the vacation. The employer must demonstrate that the employee had notice of such cont	rac	t or policy provision. Must be posted in a conspicuous place in a commonly frequented area in which 	employees work. 1. Advances paid to employees, other than undocumented cash. 2. A recurring deduction authorized in writing. 3. A nonrecurring deduction authorized in writing, when the source of the deduction is cited specifically. 4. A nonrecurring deduction for damage, breakage, shortage, or negligence must be authorized by the employee at the time of the 	ded	uction.  Employees must be paid at least once each calendar month on the regular payday(s) designated in advance by the employer. wages or compensation become due and payable at the regular payday(s) established in advance by the employer for the period(s	) worked by the employee. otherwise agreed upon by both parties. Superintendents’ offices, and local schools.  Maximum hours per day: 3 per school day, 8 per non	-school day.  Maximum hours per week: 18 per school week (any week in which school attendance is required any part of 4 or more days), 40 p	er non	-school week. May work only between 7a.m. -7p.m. (until 9p.m. from June 1st 	- Labor Day). Workers ages 14 & 15 are prohibited from performing certain job duties defined as hazardous in labor law. An individual’s right to work may not be denied or abridged due to membership or nonmembership in any labor union or labor or	gan	ization. notice (for example, a two	-week notice) is required. Contracts specifying a term of employment can pre	-empt the at	-will provisi	on. See REVERSE SIDE of this Poster for Additional Information. State Capitol      600 East Boulevard Avenue     Bismarck, ND  58505	-0340      	 	Hours:  M	-F - 8:00a.m. -5:00p.m. c. The employee gave the employer less than five days’ written or verbal notice. b. Before awarding the paid time off, the employer provided the employee written notice of the limitation on payment of award	ed 	paid time off. North Dakota Century Code (N.D.C.C.) Title 34 and N.D.C.C. Chapter 14	-02.4.  An employee employed in a bona fide executive, administrative, or professional capacity. Executive	 - an employee whose primary duties consists of: 	 	a. The management of the enterprise or recognized department or subdivision thereof;	 	b. Directing the work of two or more other employees therein; and	 	c. The authority to hire or fire other employees or whose suggestions will be given particular weight. Administrative	 - an employee whose primary duties consists of:	 	a. Office or non	-manual work directly related to management policies or general business 	operations; and	 	b. Who customarily and regularly exercises discretion and independent judgment. Professional	 - an employee whose primary duties consists of:	 	a. Work requiring knowledge of an advanced type in a field of science or learning customarily acquired by a prolonged course of specialized intellectual instruction and study as distinguished from a general academic education and from an apprenticeship, and from training in the performance of routine mental, manual, or	 physical processes; 	 	b. Work requiring the consistent exercise of discretion and judgment in its performance; and 	 	c. Work that is predominately intellectual and varied in character as opposed to routine mental, manual, mechanical, or physical work.  An employee engaged in an agricultural occupation 	– growing, raising, preparing, or 	delivering agricultural commodities for market.  An employee spending at least 51% of the employee’s work	-time providing direct care 	 	to clients of a shelter, foster care, or other such related establishment.  An employee employed in domestic service who resides in the household in which employed.  A straight commission salesperson in retail automobile, trailer, boat, aircraft, truck, or farm implement dealerships unless that salesperson is required to be on the premises for more than forty hours per week.  A computer professional exercising discretion and independent judgment when designing, developing, creating, analyzing, testing, or modifying computer programs or who is paid hourly at a rate of at least $27.63.  An employee who is customarily and regularly engaged away from the employer’s premises for the purpose of making sales or taking orders. Work unrelated to outside sales may not exceed 20% of the hours worked in the week.  A mechanic paid on a commission basis off a flat rate schedule.  An employee of a retail establishment if the employee’s regular rate of pay exceeds 1.5 times the minimum hourly rate applicable if more than half of the employee’s compensation for a period of not less than one month is derived from commission on goods or services sold.  An employee employed as an announcer, news editor, or chief engineer by a radio or television station.  An employee in an artistic profession that is original and creative in nature or where the work is dependent upon the invention, imagination, or talent of the employee.  Motor carrier as applied to covered employees of motor common, contract, and private carriers specified by the Motor Carriers Act [49 U.S.C. 31502].  A teacher, instructor, tutor, or lecturer engaged in teaching in a school or educational system.  A highly compensated employee: an employee who is paid total annualized compensation of one hundred thousand dollars or more, which includes at least four hundred fifty	-five dollars 	per week paid on a salary or fee basis. The employee’s primary duty includes performing office or nonmanual work.  Taxicab drivers must be paid overtime for all hours worked in excess of fifty hours in any work week.  Hospitals and residential care establishments may adopt, by agreement with their employees, a fourteen	-day overtime period, if t	he employees are paid at least time and one	-half their 	regular rate for hours worked over eight in a day or eighty in a fourteen	-day work period. An employer may require an employee to purchase uniforms if the cost of such uniforms does not bring that employee's wage below the hourly minimum wage for all hours worked during any pay period. Attendance at lectures, meetings, training programs and similar activities need not be counted as working time if all the fol	lowing criteria are met:	 	a. Attendance is outside of the employee's regular working hours. c.  The course, lecture, or meeting is not directly related	 to the employee's job. b. Attendance is in fact voluntary. d.  The employee does not perform any productive work during such attendance. Training or education mandated by the state, federal government, or any political subdivision for a specific occupation need 	not be counted as work	-time.  The following types of travel time are not considered work time for which an employee must be compensated: 1) Ordinary travel	 from home to work, 2) Time spent as a passenger on an 	airplane, train, bus, or automobile outside of regular working hours, 3) Activities that are merely incidental use of an empl	oye	r-provided vehicle for commuting home to work.  The following types of travel time are considered work time for which an employee must be compensated: 1) Travel during regul	ar work hours, 2) Travel on non	-work days during regular 	work hours (regular work hours are those typically worked by an employee on work days), 3) Travel time from job site to job s	ite or from office to job site, 4) The driver of a vehicle is 	working at any time when required to travel by the employer, 5) One	-day assignments performed at the employer’s request (regardl	ess of driver or passenger status).  When employees are required to remain on	-call on the employer's premises or so close thereto that they cannot use the time effec	tively for their own purposes, they are considered to be 	working and must be compensated.  When employees are on	-call and are not required to remain on the employer’s premises but are required to respond to a beeper or 	leave word at home or the employer’s business where 	they may be reached, they are not considered to be working and need not be compensated.  An earned bonus is an amount paid in addition to a salary, wage, or commission. An earned bonus is compensable when an emplo	yee	 performs the requirements set forth in a contract or 	an agreement between the parties.  A commission is a fee or percentage given for compensation to an individual for completion of a sale, service, or transaction	. Upon separation from employment, the past practices, policies, 	and entire employment relationship will be used to determine if the commission is earned and compensable.  Gratuities offered to an employee by a customer belong to the employee and may not be retained by the employer.  Employers may utilize a tip credit of 33% of the minimum wage for tipped employees. With the tip credit applied, the minimum	 direct wage payable to a tipped employee is $4.86 per hour 	effective July 24, 2009. The employer must maintain written records verifying that tipped employees receive at least the ful	l minimum wage for all hours worked when the direct wage and 	tips are combined.  A tipped employee is any service employee in an occupation in which he or she receives more than thirty dollars per month in 	tips.  A service employee is any employee who is providing direct service to the customer and to whom that customer shows appreciati	on for that service by tipping that employee for the direct 	service. The employee must regularly and customarily provide personal face	-to-face service to individual customers, which the cu	stomer would recognize as being performed for his or her 	benefit. Services such as cooking and dishwashing are not included.  An employer who elects to use the tip credit must inform the employee in advance.  Tip pooling is allowed only among the tipped employees. A vote of tipped employees to allow tip pooling must be taken, and f	ifty percent plus one of all tipped employees must approve it. The employer must maintain a written record of each vote on tip pooling, including names of employees voting and the vote tot	als. A vote on whether to pool tips is required if requested by 	fifty	-one percent or more of the tipped employees. The tipped employees shall provide documentation verifying the request. Time	 spent in meetings called by the employees exclusively for 	tip issues is not work time. Gaming sites, which regularly have four or fewer tipped employees on duty, can require tip pool	ing among all tipped employees at the site. Pit bosses or 	supervisors at gaming sites are not tipped employees and cannot be part of the tip pool when performing functions of those po	sitions other than dealing blackjack (twenty	-one). The reasonable value, not exceeding the employer's actual cost, of board, lodging, and other facilities customarily furnished by the employer for the employee's benefit may be treated as part of the wages, up to a maximum of eighteen dollars per day, if agreed to in writing and if the employee's acceptance of facilities is in fact voluntary. the essential business	-related functions of the employer, or opposition to such discrimination in the work place. employer, a governmental body, or law enforcement official.  The employee is requested by a public body or official to participate in an investigation, a hearing, or an inquiry. regulation. The employee must have an objective basis in fact for that belief and shall inform the employer that the order i	s being refused for that reason. Public employees should also see N.D.C.C. ch. 34	-11.1 Public Employees Relations Act for further information. 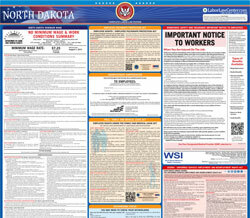 There are an additional two optional and mandatory North Dakota labor law posters that may be relevant to your business. Be sure to also print all relevant state labor law posters, as well as all mandatory federal labor law posters. Instead of printing out pages of mandatory North Dakota and Federal labor law posters, you can purchase a professional, laminated all-in-one labor law poster that guarantees compliance with all North Dakota and federal posting requirements. Fully updated for 2019! While we do our best to keep our list of North Dakota labor law posters up to date and complete, we cannot be held liable for errors or omissions. Is the poster on this page out-of-date or not working? Please let us know and we will fix it ASAP. LaborPosters.org will email you a printable PDF of this North Dakota labor law poster, 100% FREE. You'll also get notified when new posters are available. This poster download is provided as-is, with no warranty or guarantees. Please verify with Federal and North Dakota authorities to confirm that you are posting all of the correct (and updated) posters required for your type of business. Instead of printing out pages of mandatory North Dakota and Federal labor law posters, you can purchase a professional, laminated all-in-one labor poster.